My first birthday as a mommy! I have to give credit where credit is due! This "Miracle Blanket" truly is a little miracle! We have swaddled Lael at night from day 1, and after she was able to get out of the hospital blankets (which are actually really great swaddling blankets!) we knew we had to find something to keep her arms DOWN! I think it's probably the norm for babies to try to get their little hands up near their faces and Lael is no different. If they get their arms up and then fall asleep many times they experience the "Moro Reflex" also know as the "startle reflex". For the baby it is a fear of falling and when they experience this feeling they startle themselves causing their arms to flail, thus waking themselves up. It presents itself in newborns and is usually gone within a few months. During the night in those first few weeks I would hear her squirming around and just know that she had gotten her arms up. Major bummer when you just want a mere HOUR of sleep. Sheesh. I had heard about this blanket and looked it up on their website. They have a great video of a baby being swaddled in it and how it works. I knew as soon as I saw it that it was the blanket for Lael. It has two flaps inside of it that go around her arms, tuck behind her back and keep her arms straight and down. She can. not. get. out. of. it. Therefore, she can not wake herself up. It is glorious. I haven't seen another swaddle blanket on the market that can keep a baby's arms down like this one. We wrap her up every night quite tightly and she knows that it's time for bed. She goes straight to dreamland! This baby product has been a "must" for us! 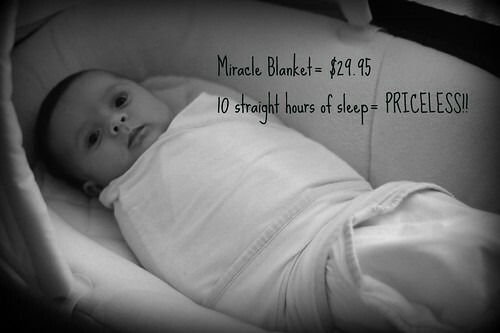 Go check out the "Miracle Blanket" web site at www.miracleblanket.com. They have lots of fun colors to choose from! Oh, thanks for the great tip! I'll have to check it out for sure! we used the "Swaddle Me" by Kiddopotumus and I think it's pretty much the same thing....a miracle! Just wait, soon she'll be sleeping 13 hours straight! she is so absolutely adorably cute. seriously. We use the Kiddopotamus Swaddle Me too! Unfortunately, Mac's four months old and getting big enough to bust out of it - and wake himself up. What's a girl to do?! We may try the Miracle Blanket; thanks for the tip!